Goal: Create a modern and comfortable living environment for a family of 4. Relocate and double the size of the kitchen. Have a separate children's and guest quarters with its own bathroom. Increase unit's storage capacity. The owners of a spacious 2441 square foot penthouse came to us with grandiose plans to completely revamp their living space. At the forefront of their vision was the repositioning and enlarging of the kitchen and the addition of 2 children's bedrooms and a full bathroom. Furthemore, all major areas of the home were to undergo a substantial change: The master bedroom storage capacity was to quadruple in size, resulting in floor to ceiling his and her closets running alongside the perimeter of the bedroom as well a sizable wrap-around walk-in closet. All doors were to be retired and replaced with new, tall, hinged and sliding doors, designed for previously-existing and newly created openings. The new doors were to impress with their height, integrated appearance and hardware: with recessed jambs and floating handles without back plates. The bathrooms were to become sleek and modern, with wall-hung vanities, toilets and storage cabinets. A special set of retractable glass partitions was to separate the new guest/study room. The children rooms were to be outfitted with built-in floor–to-ceiling furniture as well as designated sleep and study areas. The unit was to acquire overhead lighting in all functional areas and all windows were to receive new solar window shades! Excited by this challenge, Studio Verticale took on the tall list submitted by the clients and got to work. Here is how our clients describe their project: We had to live in the space for a few years to realize how we could make it work for us. The main criteria was keeping the loft feel yet making it practical for a family of four to live in so we set about drawing up plans that hid bedrooms and bathrooms behind integrated doors and mechanicals such as plumbing, AC ducts and gas behind dropped ceilings. We were concerned that dropping ceilings would take away from the grand ceiling height that our unit has so we set about restoring that by ensuring that the ceiling was flush with the door tops, the soffits above all of the integrated cabinets and the tops of the non-integrated cabinets. It is a very deliberate feature that looks really good. Another design criteria was to enlarge the kitchen out into the space without really moving it which meant that through access was needed to get back into the rear living quarters. We wanted a very contemporary look to the build out and that had to start with the kitchen. Studio Verticale offered us the Modulnova range which is very sleek and modern and has a really nice finish and feel to it. We wanted to mix textures and colours. We wanted a sitting area that we could use for our everyday meals and a place where guests could congregate without getting in the way. We needed good storage including access to about 200 cook books. It was important that this kitchen functioned properly because it was going to get used. We think the design was spot on. The Kerlite countertops and cabinet facades look great and contrasts well with the yellow Corian and grey lacquer tall cabinets. 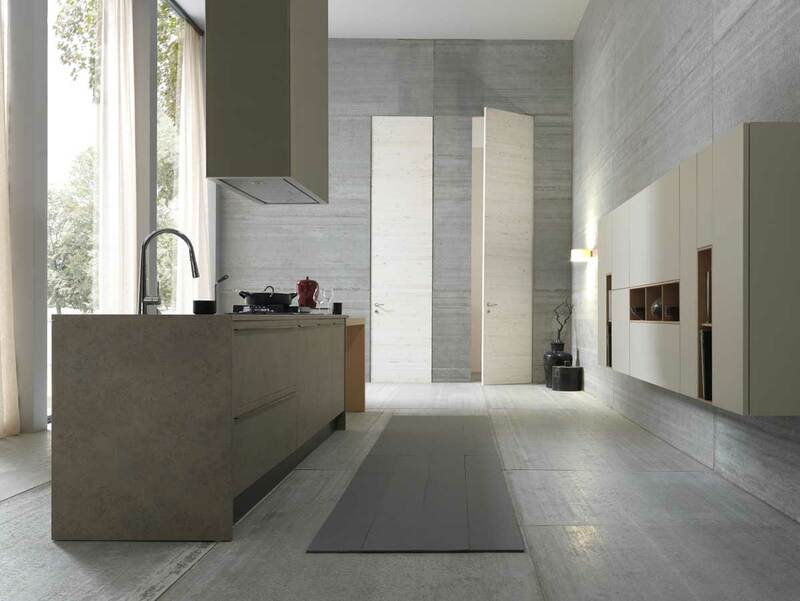 The locations of the appliances work and with the Miele product it line brings a certain kind of elegance and function. The bedrooms all needed work so we asked SV to supply integrated cabinets with enough storage space that we could put all things away. The kids rooms are skinny so we needed a solution where a bed could be fitted into the walls. The beds are trundle beds so sleep overs are a breeze. Outside the kids rooms we wanted an area that would serve as a kids play area and a spare bedroom. We were able to fit a nest of sliding doors that serve as a privacy screen yet when closed are neatly tucked away. Also back in that area we installed a 3rd bathroom which also features some color and contemporary Modulnova cabinetry. The other two bathrooms were remodeled using Modulnova and Ideal group products. The main bathroom features a sink that drains down a slope to the side. The master bathroom looks great. We particularly like the curved features that come on the mirrors and the sides on the cabinets. We adore our loft now. We are so please with the results that we are happy to share this bio with you. A word about Studio Verticale. We were pretty nervous about using another home furnishing supplier again after we were let down repeatedly by a company in NY. This time we wanted someone that was going to be local, be in business for the foreseeable future and pick up the phone when things went wrong. Mila is just that person. She has been open, honest and has stepped up when needed. If we were to ever do this again then we would be using SV.